In a new video, watch Luke Rodgers bring his audience from bated breath to inspired ovation as he shares his story of growing up in the United Kingdom's foster care system and his vision for systematically changing that system by putting youth voices at the center of all policies and decisions. 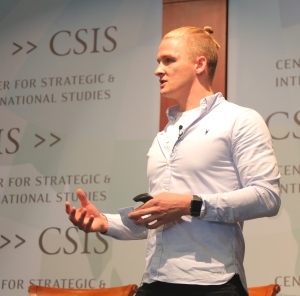 Luke's story was filmed during Generation Now, an event hosted by IYF, Laureate International Universities, and the Center for Strategic and International Studies (CSIS). During the event, young social entrepreneurs from around the globe had the opportunity to share their innovative solutions addressing education, gender equality, youth engagement, and more. In his story, Luke shares a staggering statistic. "Fifty percent of the UK’s homeless population are people who have left the foster care system." At age 15, Luke was part of that statistic. He slept on trains at night and went to school during the day. Today, he is a 2015 Laureate Global Fellow and recently named Entrepreneur of Excellence by the National Diversity Awards. He is the founder of FosterFocus, an organization that has increased awareness of children’s rights among foster agencies in the UK and reached over 1,000 youth in care through peer-led leadership trainings. Learn more about Luke's journey from foster care statistic to champion of systems change.